A vegan camping trip takes a little planning ahead but it’s worth it! 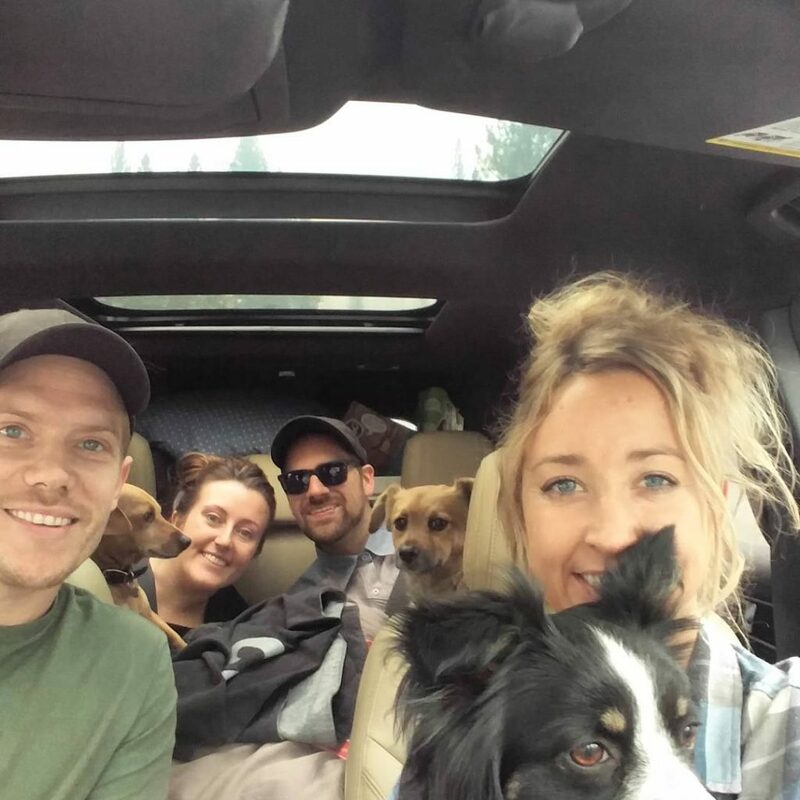 This blog includes meals, snacks, and essentials that I prepared to maintain a vegan lifestyle on a camping weekend through Yosemite. Breakfast: Warm oatmeal with a spoonful of peanut butter, chia seeds, and cinnamon + instant coffee. For breakfast, if you don’t want to start up a fire, a stovetop burner is handy. We boiled water for coffee and oatmeal easily! Rent a dual burner stove top from REI for around $20. Lunch 1: Peanut butter & jelly sandwich. You can’t go wrong with Pb&J! Think simple for lunches because you may not be near your campsite mid-day to cook anything. Lunch 2: Slice of plain whole grain and seed bread, a bag of chopped pineapple, strawberries and kiwis and a Lara Bar. Dinner 1: Foil packs filled with vegetables that we grilled over the fire. I pre-chopped peppers, zucchini, squash, and onions and placed them in a Ziploc bag. I put the potatoes, mushrooms, spices and olive oil in separate containers so I could add them just before cooking so as not to let the vegetables get soggy. We cooked the potatoes separate because they needed to cook the longest, about 45 minutes. The rest of the vegetables, about 25-30 minutes. 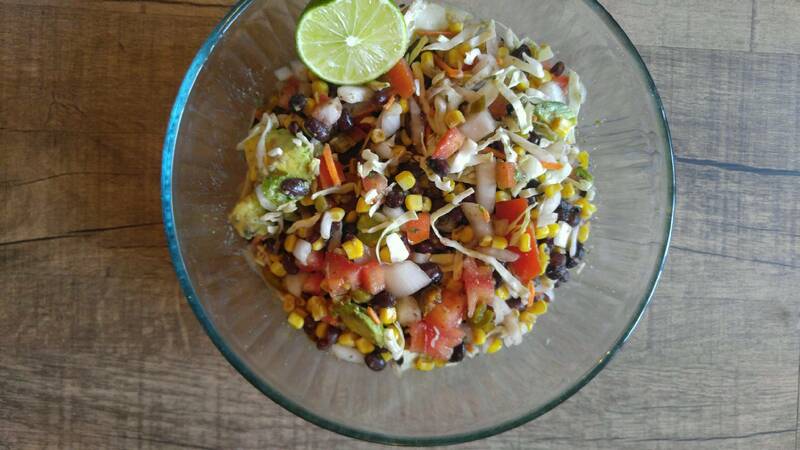 I also had a side of my black bean salad with whole-grain crackers. Dinner 2: Vegan Chili + fire-grilled kale and bell peppers. I recommend chili as an option when camping. It is easy to pack and even easier to make over the fire or on your portable stove top. Pre-make before you leave town or buy the canned version from Trader Joe’s. Trail mix: I made a variety of trail mix with the following ingredients: Almonds, walnuts, raisins, pumpkin seeds, coconut flakes, dates, and cashews. I made more than we probably needed because you never know when you are going to get stuck in a traffic jam and need easy-to-reach snacks (which we did). My favorite mixture is almonds, peanuts, raisins and pumpkin seeds. Lara Bars: These bars are packed with fruit and nuts for energy and really delicious. Honestly, they are like dessert but you can feel less guilty about them. Bananas: Easy but make sure they are at the top of your grocery bag or they’ll get mushy. Fruit bags: Chop up the fruit and separate them into Ziploc bags so you can grab and go and eat with a fork. I made mine with strawberries, pineapple, and kiwis. Cold grapes: Grapes are so refreshing after a hike! Have them easily accessible in a bag or bowl at the top of your cooler. Chia seed pudding: Before we left I made chia seed pudding to scoop into my breakfast for omega 3’s. It’s easy to keep in a cooler and use as needed. Add water, coconut water or plant milk to chia seeds. I added cinnamon to it also. Cover then chill in the fridge. Let them soak up the fluid to become jelly-like. I used mine in my oatmeal every morning. Avocados: These are great to have on hand. They fill you up and give you the healthy fat and fiber you need to maintain healthy digestion during your vacay. I added a little to each dinner we made. 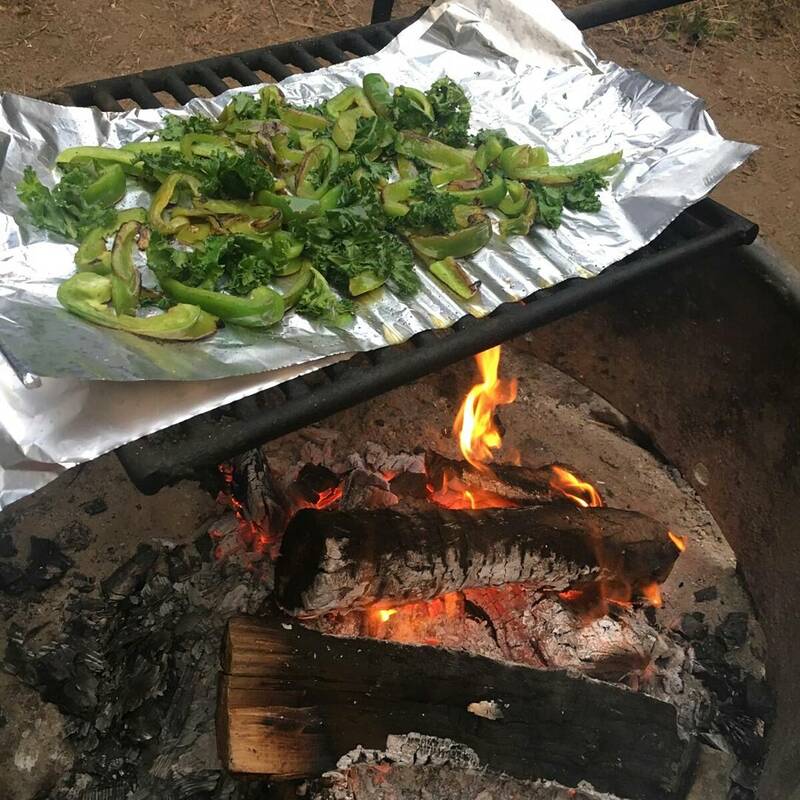 Below are a few other ways I had a vegan camping trip! Skin care products: These products are something to pay attention to if you want to live a vegan lifestyle and avoid supporting animal testing. 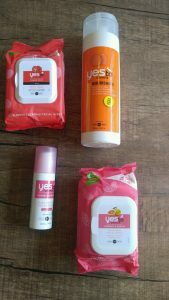 Yes to Grapefruit and Yes to Tomato wipes: If you are camping without showers you will need wipes to clean up. I ordered all my Yes To beauty items from amazon.com. US Organic Nature for Nature Bug Spray: Fend off mosquitos with this spray. It was so much better than the chemical bug repellants. It smells natural and pleasant. It doesn’t keep all of the gnats away but it seems to do pretty well against mosquitos. Australian Gold Botanical Sunscreen: This is my favorite sunscreen ever! It smells so fresh and drys within a few seconds of applying. I didn’t have the slightest bit of burnt skin during this trip and it felt good to know that I had healthy ingredients soaking into my skin. Vegan wine: Did you know that some wineries use animal products during production? I’m not going into too much detail but if you are vegan for the animals, then you should pay attention to your alcohol too. Here are a few wines I took on the camping trip. 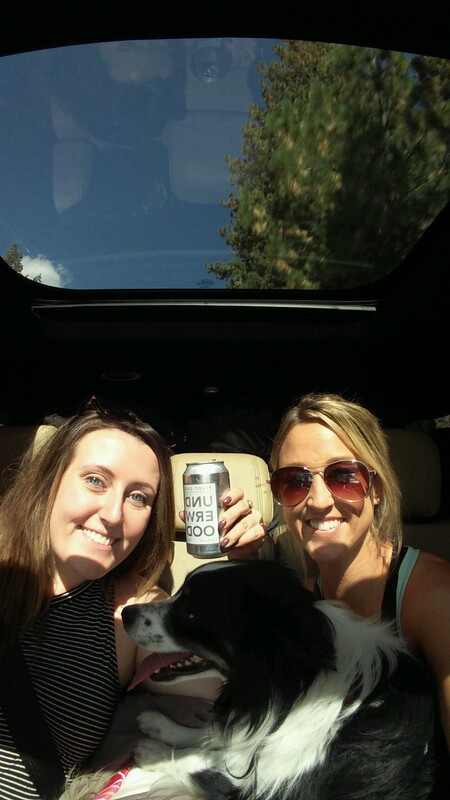 Underwood Canned Wine: Looks just like a beer can, fits perfectly in the cooler and in a beer koozie too. You can find this at World Market or order it online. Santa Margherita: pinot grigio and Chianti (the half bottle size fits easily in cooler) The pinot grigio is super refreshing after a long day of exploring and the Chianti is perfect to enjoy while cozying up next to the fire. The Vegan Vine: Try this wine with or without a camping trip. I’m sure you’ll enjoy it. Let me know if this was helpful in planning your vegan camping trip. If you aren’t much of a camper but want to stay close to the park, try a local Airbnb. 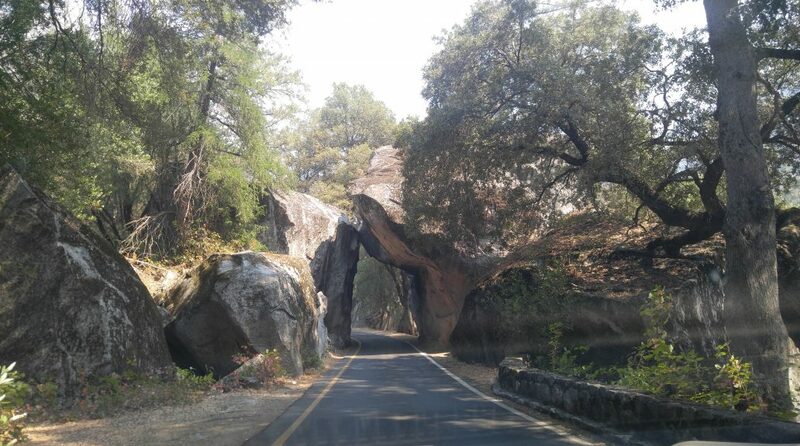 Hotels near Yosemite are just ok so take advantage of this link. $40 towards your first stay and it will help me make more of these healthy travel blogs. Thank you! Thank you sincerely for reading and please send me emails with comments and questions! What a fun trip! Those grilled veggies were fantastic!